It has taken me several attempts but I’ve finally learned how to make crepes. I think my entire life I’ve only attempted making them three times (this being my third) because I’ve never really been in love with crepes. I’ve only ever eaten them a number of times because I’ve always chosen pancakes or french toast or some other breakfast entree over crepes. Making a batter with a proper consistency. Allowing the batter to rest so bubbles subside. 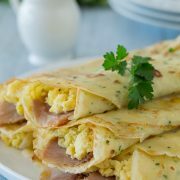 Using a good non-stick pan (you definitely don’t need a crepe pan to make crepes, just a good non-stick 8-inch fry pan). Working with a hot pan. Really swirling and lightly tilting the the pan immediately after or even while pouring batter in to get an even thickness. 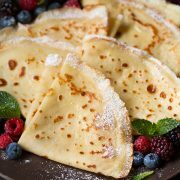 Crepes are very versatile so definitely try this recipe at least once, but when you have different fruits on hand you can use those for the filling. You can also use the other classics, like Nutella or sweetened ricotta. For this recipe, if you don’t have vanilla beans or paste you can simply use vanilla extract. But I sell Vanilla Beans! Are these dessert or a fancy breakfast? I’ll let you be the judge of that. Enjoy! 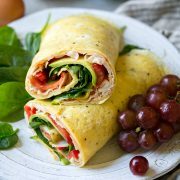 Such a dreamy crepe recipe! 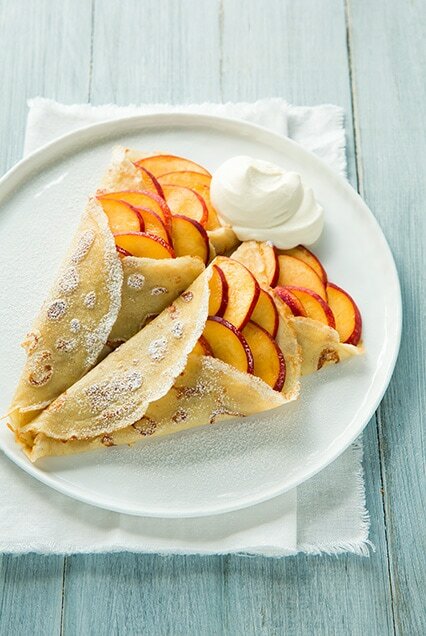 Perfectly delicate and tender, vanilla bean speckled crepes are filled with fluffy whipped cream and fresh, juicy sweet peaches. 1 Tbsp vanilla bean paste or seeds of 1 vanilla bean + 1 tsp sugar I sell them! In a blender combine milk, flour, eggs, butter, vanilla bean paste and salt and pulse mixture until well blended, about 10 seconds. Transfer mixture to an airtight container and refrigerate 1 hour. Meanwhile, prepare cream filling and peach filling. To prepare cream filling, pour heavy cream in a mixing bowl, and using and electric hand mixer set on high speed, whip until stiff peaks form. In a separate mixing bowl, whip cream cheese on medium speed until smooth and fluffy, about 3 minutes then blend in powdered sugar followed by vanilla. Gently fold whipped cream into cream cheese mixture. Cover bowl with plastic wrap and refrigerate until ready to assemble crepes. To prepare peach filling, place sliced peaches in a mixing bowl along with lemon juice and sugar and gently toss to evenly coat. Let rest until ready to assemble crepes. To prepare crepes, heat an 8-inch skillet over medium-high heat (be sure to use a pan that has a good non-stick coating or you'll likely just end up with a mess). Once pan is hot, coat lightly with butter (I just ran the end of a stick of butter along the pan - just the bottom of pan and lower third of the rim) and pour about 3 Tbsp batter into the pan and immediately swirl pan in a circular motion while slightly tilting pan to allow batter to coat bottom of pan entirely in an even layer (it should go slightly up along the rim of the pan as well. Another note, don't try and measure out 3 tbsp separately to pour into the pan, just use a 1/4 cup dry measuring cup and fill it three fourths of the way full). Cook crepe about 25 - 40 seconds until top of crepe appears dry and edges are lightly golden. Flip and cook opposite side until golden 10 - 20 seconds longer (if you find you pan is becoming to hot and crepes are cooking to quickly, reduce burner temp slightly as needed). Repeat this process with remaining batter, buttering pan before cooking each crepe. Stack cooked crepes on a plate or baking dish. 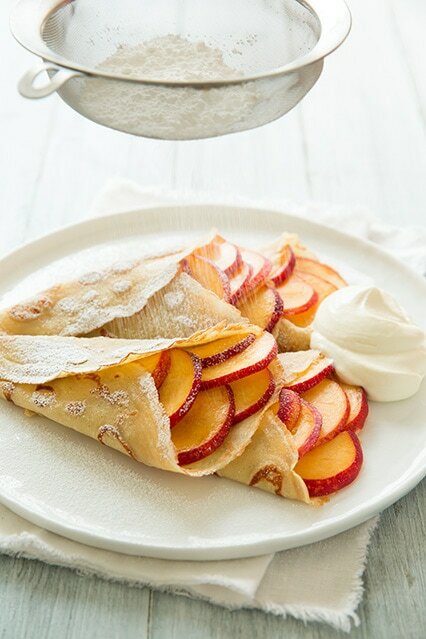 To assemble crepes, fill each crepe with peach filling, wrap, and top with cream topping and dust with powdered sugar. Thea: Hey Jaclyn, I LOVE ur site, I’m always checking out ur recipes at work.. (oops) ur photos make me sooo hungry.. I note that you said I could replace the vanilla bean/paste with vanilla extract, but I also see that the recipe already needs vanilla bean/paste plus vanilla extract.. So I was wondering how much more vanilla extract should I add in to substitute the vanilla bean/paste?